The Management Team comprises of many professionals from diverse domains and are well qualified and experienced to handle the day to day operations. Purple’s explosive growth warranted the inclusion of professionals with proven track records to carry forward, consolidate and charter new horizons of growth in the following years. Shri Prasanna Patwardhan is the current Chairman & Managing Director and has been instrumental in not only consolidating the group activities, but also taking the group to the next level. Such exponential growth has been accomplished through his Visionary Business acumen and the respect that he commands within the business fraternity. 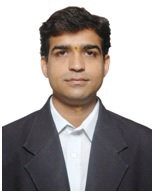 Mr. Patwardhan is a science graduate with professional management education. An avid sportsman, he was the captain of the Maharashtra team and has also played for the national Basketball team. 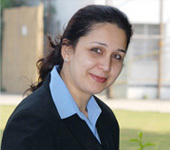 Mrs. Monica Patwardhan heads our holiday vertical. 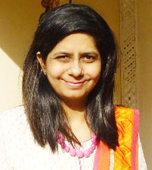 She is a passionate traveller who has toured all over India and abroad and her rich experience helps her design smart itineraries and tour plans. She loves to discover new destinations & new attractions in old destinations which gives us an edge for creating a "Smart Itinerary". 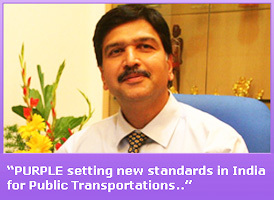 Mr. Rohit Pardeshi is working as Purple’s Chief Operating Officer-Group. He has a very rich experience in this domain with in-depth knowledge on fleet machinery, route planning, maintenance etc. He has been associated with this group for past 22 years and is an integral part of the growth and development of this organization. 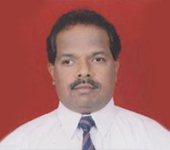 Mr. Ravindra More is working as the General Manager of Intercity. His association with this organization is over 25 years old. He handles day to day operation & management of this vertical. When he joined the organization, the company had 2 buses and today that number is more than 50 buses for the Intercity vertical. Col Nikhil Vaidya is working as the General Manager of City Bus Operations. He has over two decades of experience in the Indian Army. He was responsible for designing and implementing strategic and operational plans at multi locational, regional and Greenfield Project levels, in addition to managing large scale human resources and vehicle fleets. He has an MBA from IIM Bangalore and professional qualifications on Defence Financial Planning, Senior Defence Management and Transport Management. He handles the pan India operations of our City Bus vertical. Vishal has more than 19 years of experience in Business operations and sales and marketing. He has a Master’s degree in marketing and operations and is an Arts graduate with honours in sociology. With expertise in strategic planning, sales analysis, launching new products and services, he is a dynamic leader with an extremely successful sales career. Under his leadership, his region got “Best city in India” thrice. His extensive travelling has taught him about many cultures and about the importance of adjustment and humility. He is a very results-driven leader. His previous stints include being a Vertical head, National sales head and General Manager sales with companies like Leeway logistics limited, V link fleet solutions (Branded as MERU), Smartalk - An Essel group company, Beltron telecommunications and Sterling holidays. He has served in multiple cities like Mumbai, Chennai, Kolkata, Surat and Pune. He is a dedicated and talented organizer, motivator, team player and a decisive leader with a successful track record in taking an original concept and developing it into a fully formed project which is capable of handling diverse market dynamics. Manoj Daniel brings more than 23 years of experience to the Prasanna Group in the field of marketing. He was the Chief Marketing and Sales Officer (CMSO) for Keolis Hyderabad, the O&M partners for Hyderabad Metro Rail. Keolis is a one of the leading global public mass transportation organization, managing different formats of mass transit across 18 countries. 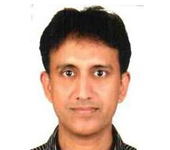 Mr Manoj joined the FMCG industry (1991-1998) as head Marketing Communications at PepsiCo Hyderabad and later moved to PepsiCo Nepal operations where he handled the additional vertical of Business Development and Key Accounts. He also worked with Prasanna Purple as our Marketing Head for a short period of time to roll out a few city transport projects in a couple of cities in Maharashtra, Madhya Pradesh and then moved to New Delhi to support the teams which rolled out the DMRC Feeder Buses and also the first of its kind of buses, the 'Hop On Hop Off' (HOHO) city tourism buses for Delhi Tourism in New Delhi. He is an expert in Marketing Communications, Brand Management, PR and Events & Promotions. He is a first class post graduate in Business Management in Marketing and Finance. 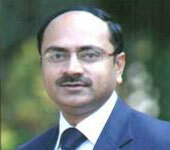 Mr. Mazhar Shaikh is working as the General Manager of the Holiday Vertical. He is a Commerce Graduate with a MBA in Marketing & Diploma in Travel & Tourism, from the University of Mumbai. 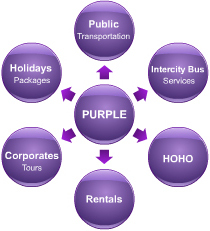 With more than 15 years of experience, he has handled & lead teams in all departments of the Tours business. Tushar heads the Information Technology wing at Prasanna Purple. He is an expert at rolling out large IT initiatives and projects for the group. As an IT professional he specializes in working with multiple teams and understands the business of successfully implementing IT projects inside and out. 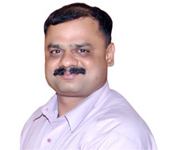 A competent technology guru with more than 20 years of hands on experience, Tushar is excellent at customer and vendor engagement with proper expectation management. He is responsible for the commercial success of many different projects. He is a strong motivator with effective interpersonal skills and with a solid network. A leader who leads his team from the frontline by maintaining strong people relations and conducting business with a personal touch. Additionally the senior management includes professionals heading each domain vertical like Procurement, Engineering, IT as well as General Managers at all business units across each region.